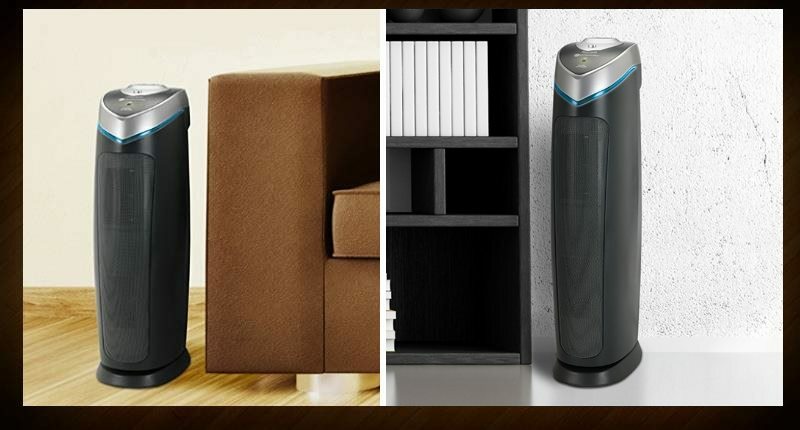 As they’re very similar, these two popular air purifiers can be a bit hard to decide between. 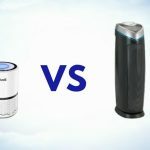 I’ve put together a detailed comparison of the GermGuardian AC4825 vs AC5000 as I’d love to help you make the right choice. When it comes to picking the right one, it’s not just about price. What are the real differences to know between the two? How does their performance compare? And which is best for your needs? 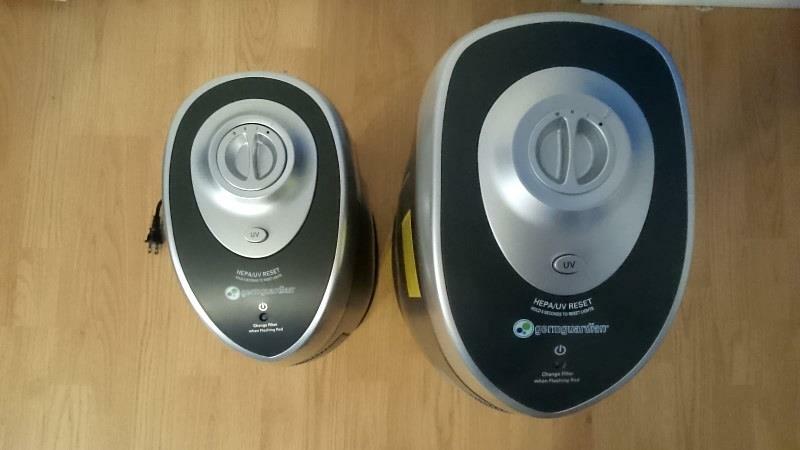 I’m a proud GermGuardian owner and I’ve had the pleasure of testing both. Read on to find out what you need to know and make the best decision. Clean, fresh air is only a few steps away! Short on time? You can jump to the simplified comparison table here. 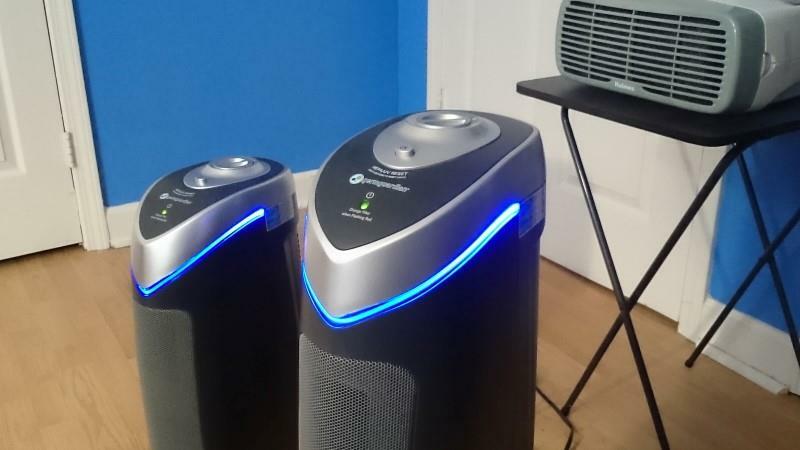 The AC4825 and the AC5000 (sometimes shown as the AC5000E) are two of the most popular High Efficiency Particulate Air (HEPA) filter based air purifiers sold today. Because they use true HEPA filters and because of their great ability to circulate air in a room, they’re very good at removing air quality problems. The AC4825 is one of the top sellers in its price range with an amazing number of great buyer reviews and feedback. The AC5000 is similarly a favorite among purifier buyers and has a established itself as a popular buyer choice as well. Based on my personal experience from owning & using the AC4825, I totally agree! But it’s not just performance that they’re known for – the quality and ease of use made me a believer right away. These 2 models are definitely very similar in style, so I can totally understand how you might be a bit confused between the two. While knowing the differences in specs can help, in my opinion it’s actually more important to read a full review and comparison from someone who’s actually tested both. Let’s start with the basics first. Below is a side-by-side comparison of the specifications (including features) of each. Later I’ll go into more detail about the small differences as well as similarities between the two. As you can see by comparing the details above, they’re identical in features. Both also have the same great features and quality that make the AC4825 so popular. It’s one of the best-selling air purifiers today – check out the amazing number of buyers over at Amazon, for example). The most important thing to take note of is the difference in their room size coverage and warranties. While the AC4825 is recommended for medium sized rooms (167 square feet), the AC5000 is well suited for large rooms (180 sq. feet in size). Both models are well-made and are housed in a strong ABS plastic body with a satin black finish. Both designs use a rotary fan switch that allows you to easily operate the purifier. The rotary switch feels good in my opinion and makes operation incredibly easy. The UV-C germ killing feature is activated by an on-off momentary push button on both. This kind of control makes operation a breeze and I like how it feels when I switch it on or off. Note: if the UV feature is turned on and then the purifier is switched off afterwards, you’ll have to turn it on again the next time. There’s no memory feature. 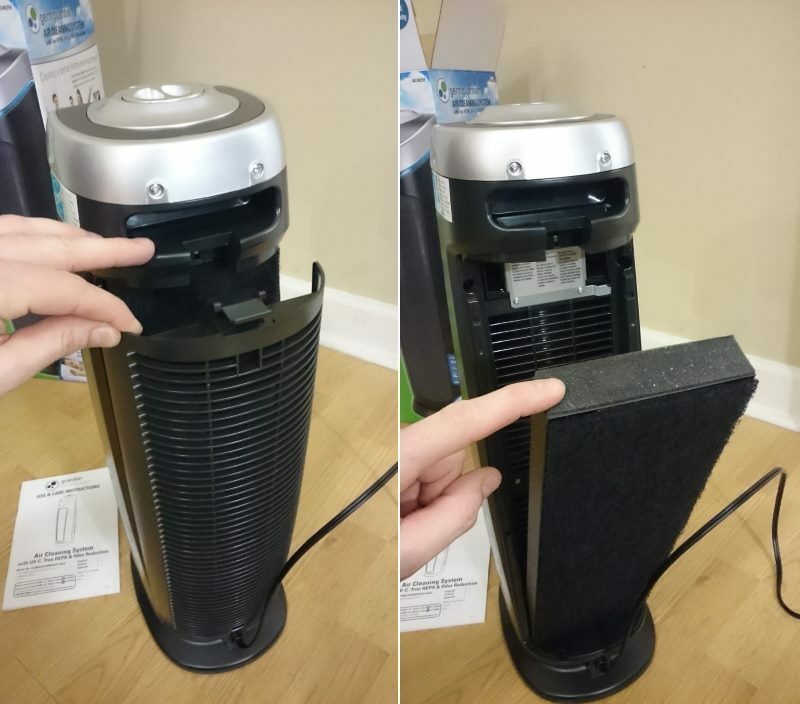 These two sibling air purifiers use a single electrical motor located in the center of the body that’s attached to not one but two cylindrical fan blade assemblies. 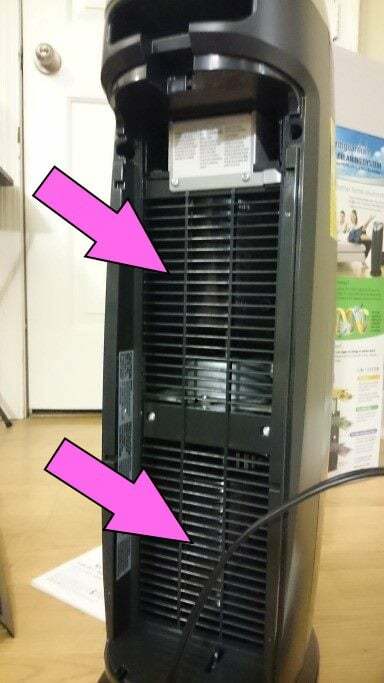 The pink arrows show the location of the internal fans in both, with the AC5000 being a larger version of the AC4825. Two fans are used together to move air with more efficiency. The electric motor (pictured, silver object in the center) drives both. Both models have a built-in handle at the top rear as shown in the image above. It’s a great feature to have and makes moving them easy. While neither are really so heavy, they can be a little bit cumbersome to carry due to their height. This feature makes it easier in my experience. Both models have good fit and finish – assembly is good with no unusual gaps or quality issues. The finish is really nice and I like them both – a nice satin finish for both the body and the trim near the controls. As you can see there is a bit of difference in size between the two – but that’s expected. The AC5000 has a higher Clean Air Delivery Rate (CADR) as it is larger and has the ability to move more air. There’s no substitute for size when it comes to fans & purifiers! Size-wise, there is a little bit of difference, as the AC5000 stands at just under 28″ (71 cm) tall. While the AC4825 is just under 22″ (55.9 cm). In practice, though, I didn’t have any real problems with that. In terms of width and overall size, the AC5000 is definitely a bit larger and it’s a bit deeper in size as well. Honestly after having used the AC4825 for some time now I found its big brother easy to get accustomed to. 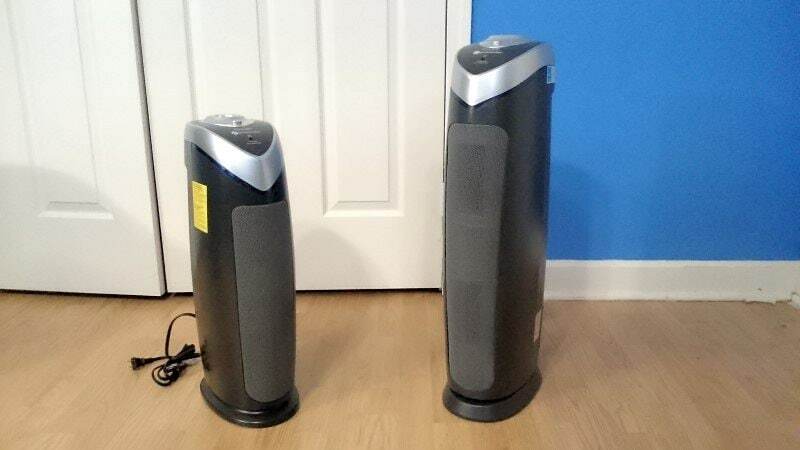 Both purifiers worked great against my main air quality concern – dust. However, as I expected, the AC5000 is more capable than the AC4825 at filtering air (it’s more efficient) and therefore performed better. Before I purchased my AC5000 I used my AC4825 for some time in a small room and it really made a big difference! As I mentioned here, it really helped a lot with my dust problem and caught much more dust than I had ever expected. Note that I’ll go into a bit more detail room size and cleaning ability below. I tested and compared both, especially as I already have considerable experience with the AC4825. My first thought about the AC5000 was “I bet it’s louder since it’s larger.” I was very wrong! In fact the AC5000 is a very quiet purifier and the sound level was nearly identical to the smaller AC4825! 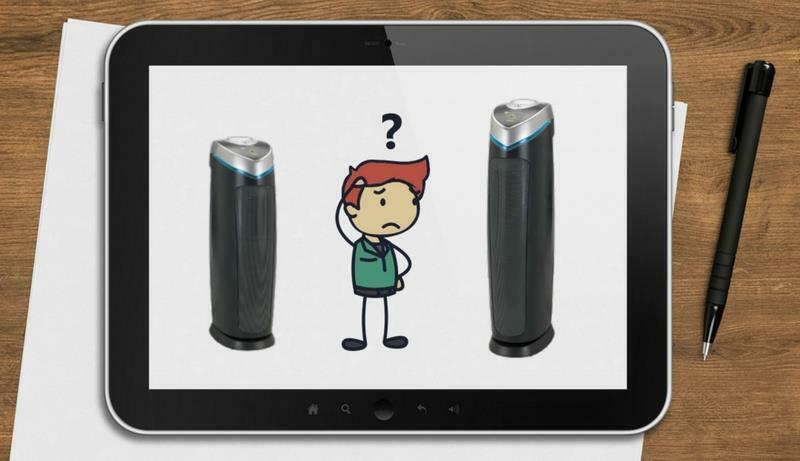 It’s worth mentioning that one characteristic of the GermGuardian AC series of purifiers is a slight “whirring” sound they produce when in use. It’s due to a combination of things, one of which is how the motor is driven electrically. Second, it’s a trait of the motor itself (this is common for many electric motors). I mention this so you’ll understand that neither, when brand new, are perfectly silent on the lowest setting. They are, however, both very quiet indeed. Unless you’re the lightest sleeper like me, the low setting is very quiet and both operate with low noise. They both sounded extremely similar to me and very pleasing to the ear. No complaints or big differences between the 2 in terms of their noise levels. Here’s some real data. 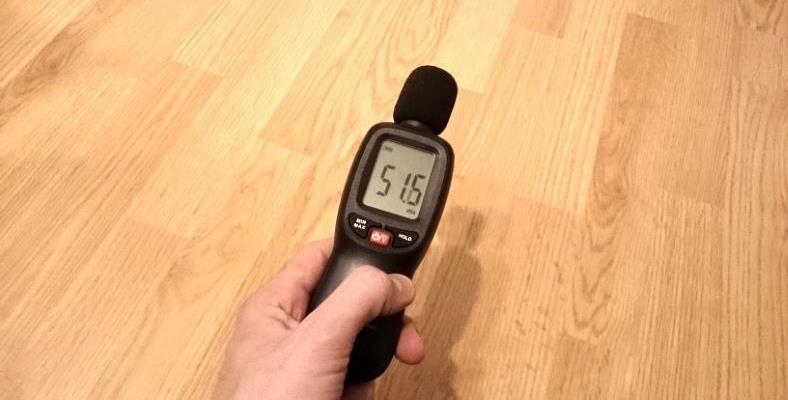 To document what I actually heard, I measured volume levels using this great little digital sound level meter I bought at 1 meter (3.28 ft) from the purifiers. As you can see, they’re almost identical in fan volume, which was a bit surprising (but I’m not complaining!) Both are very quiet on the lowest setting with the AC5000 being about the same or a tiny bit less on high. Both of these models use a replaceable ultraviolet light (UV) bulb. 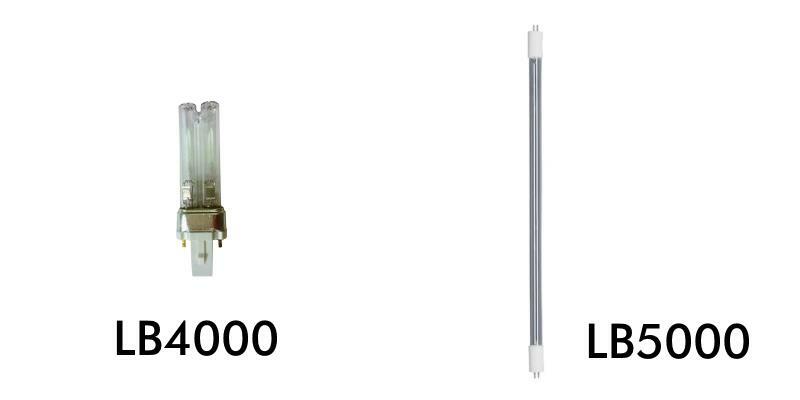 The AC4825 uses the LB4000 (about $25) while the AC5000 uses the longer LB5000 bulb (around $29). In either case, it’s usually 10-12 months or so life expectancy for the bulb. In all cases it depends upon use. For example, if you rarely use the UV-C germ killing feature you’re not likely to need to replace it for years. The pre-filter can be replaced separately from the HEPA filter or in a complete set. Although it can’t be washed, you can vacuum the pre-filter and replace it after about 6 months or so (less with heavier use). That will allow you to prolong the life of the HEPA filter, as there’s no real need to waste money on a new one when the current one still isn’t completely full yet. That’s especially helpful if you have pets which shed a lot or have a bad dust problem like I do. After some time in use, my pre-filter built up quite a bit of dust it had captured. I carefully vacuumed it off and it was ready for action again! The AC4825 replacement set uses ]amazon link=”B0055521W0″ title=”the LFT4825 package”/] while the AC5000 uses the larger FLT5000 package filter set. In both cases, remember that this is for a complete set. If the HEPA filter isn’t completely saturated you can save money by buying separate pre-filters, which are less expensive. Expect roughly 6-9 months of use from the filter before replacement, although that varies with use & needs. Heavier conditions and heavy odors and especially heavily dirty air (like with hair for example) will require a sooner replacement date. Likewise, for low-demand conditions like in my home, you can expect the filter to last longer. You’ll still need to check the filter manually and reset the filter replacement reminder yourself, as there’s no way for the purifier to know how soiled the filter is. For air purifiers in this price range there’s no way to know for sure without checking yourself. The reminder is more of a suggestion than a rule. 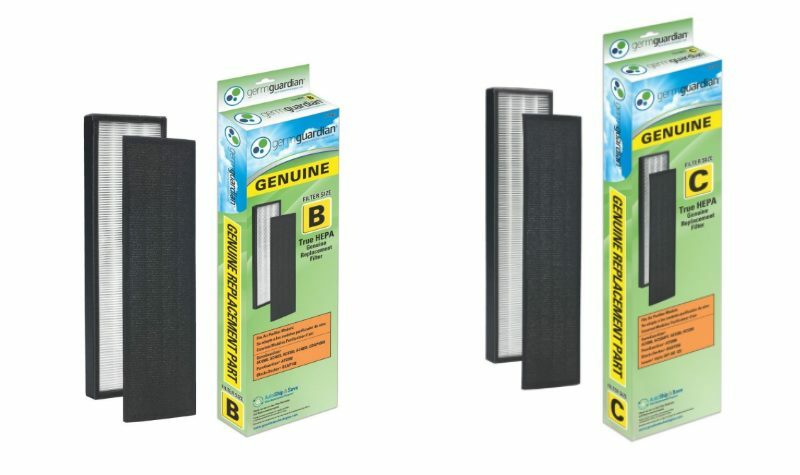 These GermGuardian models allow replacing the pre-filter separately. This is especially helpful if you have pets, cigarette smoke, or other odor-causing contaminant sources. Those are absorbed by the carbon filter and will require a replacement to restore the effectiveness of it. Having a purifier that allows the pre-filter to be replaced separately is a big advantage! Not all do. This saves money and reduces waste because in many homes the HEPA filter’s life can be extended. One of the main differences between the two models is the room size coverage recommended by Guardian Technologies, the manufacturer. In both cases, these are recommended room size applications for you to use them in – it’s not mandatory. However, in the case of air purifiers, it’s helpful to understand that the recommended room sizes will tell you how effectively the purifier will clean the air. You can most certainly spend a little bit more and get the AC5000 which will clean the air in smaller room more quickly than the AC4825. On the other hand, if you can’t afford the AC5000 you can still get good air cleaning however it will take more time to clean your room. 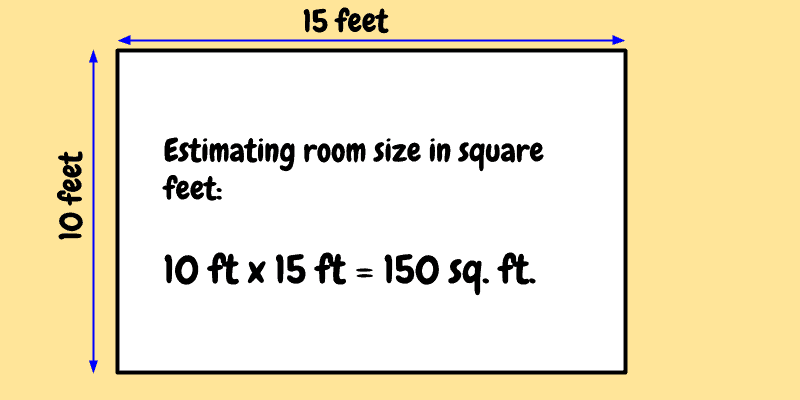 Don’t let room size specifications discourage you in case your room is a bit larger. For a good quality air purifier with great air flow and adequate ventilation, it’s possible to clean the air in a somewhat larger room well. You’ll need to give it additional time to do so but it will. The main thing is understand that air purifiers work by cycling air and filtering it. After some period of time all of the air in a room will have been filtered and cleansed. For both models, the power light (a soft-glow LED) is normally green during standard operation. It will turn red and flash as an indicator when the filter needs to be checked and possibly replaced. You’ll need to reset the reminder when that happens, which is easy. Simply push and hold the UV control button for 5 seconds. On the AC4825 and AC5000 the blue glowing trim (the light glowing when the UV-C feature is in use) will blink when it’s time for bulb replacement. You’ll need to reset the reminder using the UV button after bulb replacement. Both models indicate it’s time to replace the bulb by continuously blinking the blue light / trim on the front. When in use the UV-C feature illuminates the trim surrounding the base of the top of the purifier. It’s a nice touch that looks great. Here’s a basic chart to help you understand the meaning of the blinking light patterns. Filter replacement is identical for both and is one of the easiest to replace that I’ve ever seen! It’s just a simple matter of pulling down the release tab, removing the cover, leaning the old filter out, and leaning the new back into place. Then simply hook the cover back into place (with the tabs at the bottom) and snap the cover back in. You’re done! It takes all of about 10 seconds to do. Filter replacement is LITERALLY a snap on both the AC4825 and AC4900CA! Both are identical in how filter replacement is done. (Left) The cover is removed by pressing the release tab at the top, then after the cover is released the old filter can be removed (right). Installation is extremely simple and is just the reverse of removing the old one. I really like how easy it is! They’re so close in appearance and the “feel” that you won’t be able to tell them apart, probably. There’s no difference in how the controls operate. Both feature a power-on LED which, when green, indicates normal operation and turns red to indicate filter replacement should be checked. The fan speed control is very simple as you just switch it from the off position to speeds 1-3. While that might not seem impressive to some, remember that some people (especially the elderly) find more intricate electronic controls difficult to operate and potentially frustrating. By using simple, clearly labeled controls, there’s none of that. Just turn it on and forget it! As I’m sure you’ve already guessed, there is a bit of a difference in price. The AC5000 is roughly 25% more efficient at air cleaning than its little brother the AC4825, it’s bigger, and is priced accordingly. Regardless of pricing, they’re both great performers and are very well-reviewed. You can’t go wrong buying the AC4825 in case the AC5000 is outside of your budget. In the worst case air cleaning may take longer if you use the AC4825 in a large room. But it’s certainly not a deal-breaker. Maintenance cost differences between the two models are minimal, and both are surprisingly quiet in use. I can’t tell the difference even though the AC5000 has more air flow and is more efficient! It’s that good! Aside from the points I listed above, they’re essentially the same. They’re both wonderful & hassle-free purifiers that work well to clean the air, but I recommend the AC5000 if you can afford it. UPDATE! Great news! There’s a newly-offered white version of the AC4825. Finally there’s another option for those of you who prefer more color options. Check it out! 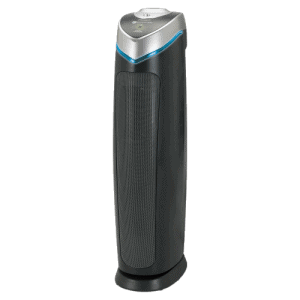 The GermGuardian AC4825 is an excellent model for medium sized rooms that I’ve enjoyed owning. You can find the best price and many amazing buyer reviews over at Amazon. 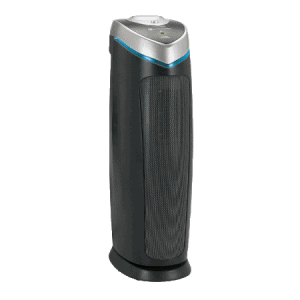 My GermGuardian AC5000 is a wonderful and quiet purifier for large rooms. Head over to read more about it and see the current price now. Considering the AC4825 but still not sure? Read my detailed review of it here. If the AC4825 or AC5000 are still too expensive for you, don’t worry! I put together a list of great air purifiers for less than $100. 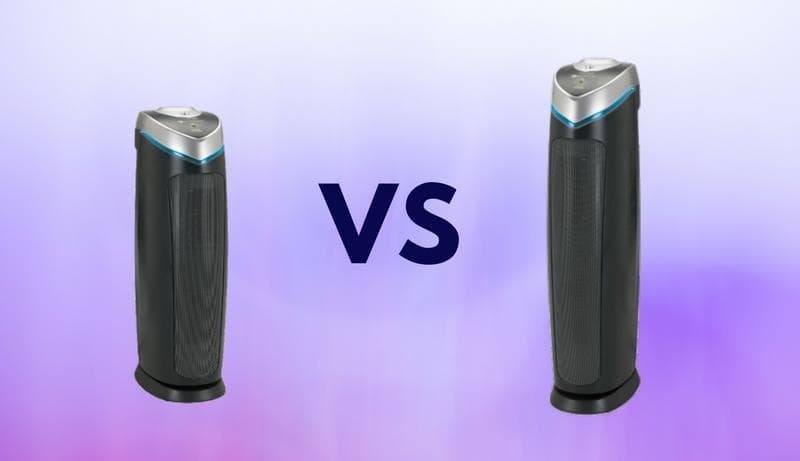 Levoit LV-H132 Vs GermGuardian AC4825 - Which One Should You Buy?